I believe that deep inside lies a flame. A light if you will. I call it faith. I don’t mean religion. Religion is how many chose to embrace, celebrate and nurture their faith. But faith comes in all formats and I believe in each one of us exists this glowing essence. Faith is the language of the soul. The glow from within. The flame glows mightily for some and almost imperceptibly for others. But it’s always there, none the less. Beautiful expressions. Reading this post I feel like sharing a quote “I close my eyes so I can see”! It is the intangibles that we need to see. I very much agree with you Penny. 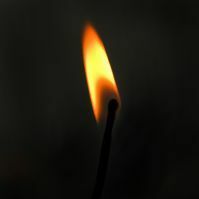 This is such a wonderful post… really makes us realize we are one – not separate — and though we may believe different things, really it is all about that flame – that light…the one each of us possess regardless of how bright it seems at any given moment. A beautiful post, one that leaves us thinking. You are really good at this my wise friend ~ Goodnight now – as I head into my tub with the flame of my candle illuminating the room 🙂 Much Love! A nice way to begin my day. Thanks Rosy, I believe in what I call the Universial religion, I know God has room for everyone. “Faith is the language of our soul” – I love this! I believe you are right on. The spirit inside doesn’t need to follow a religion to be spiritual, but some peoples’ flame is lit by their strong faith within a religion and that’s okay too. Without it they may flounder about. Sometimes faith is extinguished by chronic wind a rain and then hope may evaporate as well. Then it is choice time. To become extinguished or keep lighting matches. I’ll take the latter approach. Faith reminds it can’t wind and rain forever. I’m glad you said “I don’t mean religion”. When people say faith, I tend to switch off. But I’m glad I didn’t. It was a very interesting story that certainly made me think from a different angle. Thank you. And well done on the award. Mondrak I really appreciate your words. I agree with you about words that “turn people off”. Thank you so much, I’m hoping your day is going well for you! I think…believe…there is something in me that can never be revealed or known to others. Not that I don’t try, but it is so deep that no words can explain. I have often struggled to let this person out. I often wonder how others see me. It is very difficult if not impossible to see your own self. To every person/friend/relative we are a different person. And we see others differently from how they are seen by others. Something tells me I should stop while I am ahead.